I am sure that whatever I'm going to write, no one will want to read. I never had a blog because you have to write it. Which means you have to know something. I don’t know anything, which leaves me at a disadvantage. However, my new website has a space for a blog, and if I left it empty people would notice. I am sure that whatever I’m going to write, no one will want to read. I find this depressing. No one will care, my website will be a disaster, my publishers will become discouraged and drop my series, I’ll never get another book contract and I’ll have to go back to working job-jobs like in the bad old days. Such jobs were unskilled, low-paying, and dead-end. For instance, I once sold plastic Ziplock bags, the type drug dealers used to sell cocaine in. I sold them empty, and couldn’t understand why they didn’t sell. 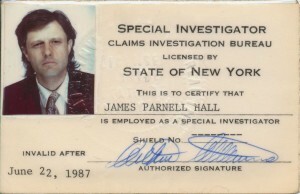 Parnell rarely flashed his private investigator ID, and for good reason. Look at the photo. Would you let that man into your house? I also worked as a private investigator, where I dealt with people whose bags were full, and in the slums and crack houses where I plied my trade I was always afraid someone was going to mug me for the money to replenish their stash. Anyway, what I’m writing now is exactly what no one will care about and will lead to the end of my career. However, for my upcoming book Safari (and look how long I held out before I mentioned it), I went to Zambia, and have a bunch of neat pictures of wild animals. I’m going to post one, just as a teaser. And if I don’t get booed off my own website, I’ll post more photos from the safari with stories of how they came to be taken. If you like this blog, you’re easy to please, angling for a free book (which is not forthcoming), or not particularly discerning. Keep coming back. Tell your friends, if any. And like me on Facebook, or however that works. I still can’t figure out how to tweet. You’re hysterical. Thrilled to hear about a new Stanley Hastings book. What a treat. O.k., Parnee, fess up: that is so not your signature on the i.d. card! I read it. You are funny. Maybe I’ll try one of your books. Love your books. 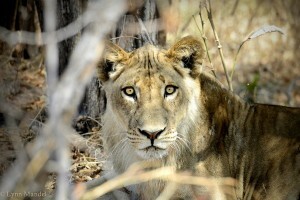 Hope to see more safari pictures too. I don’t see the point of tweets either. I didn’t want to read this. I won’t want to read the next one, either, but I will, because eventually maybe you’ll stumble across something that I do want to read. So I’m going to keep on reading, buddy, until you cough up something to read. Uh…er…did somebody say Stanley Hastings? oboyoboyoboyoboyoboy! I love your new web site, Parnell. I you two have many happy years together. That does not look like him on photo ID I think hes pulling our leg! The picture is indeed me, taken for my photo ID in 1985. Granted, I have more hair. The signature is not mine. It is the signature of the head of the Claims Investigation Bureau, certifying I am one of their agents. I had to show this ID sometimes. No one was very impressed then either. Now that you’ve visited one of the most provacative places on this planet, I as a citizen of Baltimore (the city that reads) would like to extend an invitation to Stanley and Alice to come visit us here. We are still celebrating the 200th year of the writing of the Nation Anthem. Baltimore is’nt far from New York. I know because my family spent a few summers in the Bronx. So come do some sightseeing down at the Inner Harbor…visit the National Aquarium,the Science Center,and the pengiuns at our famous Balimore Zoo. Stanley and Alice can even take a ride on the Baltimore Bay Lady for a midnight cruise eating crab cakes ans sipping wine on the Cheasapeake Bay. I’m quite sure nothing will go wrong! Mr. Hall, I’ve read all your books. I am impressed by the inner hero in Stanley, startled by Steven’s wit and bravado,and really just frightened by the Puzzle Lady.